MID (Mobile Internet Device) is a new trend for consumer markets. In terms of form factor, it is preferable to be small but yet hope to have a bigger screen for viewing. In reality it doesn’t seems to be possible as the LCD panel will contribute to the actual size of the end products. Now, there is a new solution being disclosed by Lumus during CES event recently when it showcased a new spectacles with internet and video streaming on the go. The spectacles is quite stylish and doesn’t look bulky even though with all these high end features being integrated in. Virtually, it can project any internet browsing contents or media streaming that appeared to be 72 –inch in front of your eyes. The mechanism behind is the embedded miniature projector that able to beam any images to be displayed on the lens. 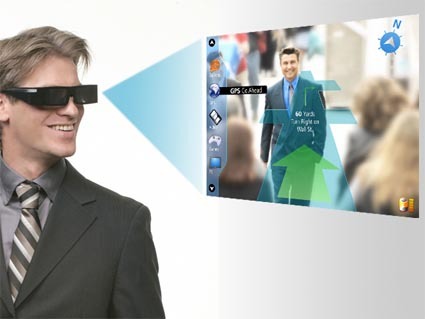 Just one thing, the user need to connect the spectacles to mobile phones for cellular network connectivity. What is more, the spectacles is believed to be able to connect to GPS (Global Positioning System) module for location and path finding. As of now, this is still in Proof of Concept stage with further exploration needed before a real product can be realized. Current challenge is to really focus on how to integrate all these components into the spectacles without increasing its size and cost significantly.